Malcolm comes to an end. In the series finally of Malcolm in the Middle, Malcolm is elected valedictorian of his graduating class and struggles with his speech, but Lois refuses to hear his complaints and reveals her plans for him to become president of the United States. On the opposite end of the spectrum, Reese will do anything to get a permanent job as the high school janitor, even concocting the most disgusting mess of all time, which explodes all over the family. Meanwhile, Hal struggles with Malcolm's Harvard tuition, and Francis lands a "real" job working 9 to 5 in a cubicle--and enjoys every minute of it. Grandma Ida (Cloris Leachman) returns for the family festivities, and they all bid farewell to Malcolm when he leaves for college. I am planning to have the first and final episode up for the month of June. This month will be featuring The Boondocks. There is only one episode, however there are some promos along with it. I decided to put this show on considering that it has turned into one of my favorite shows. I had been looking forward to seeing this show ever since I saw billboards and promos advertising this show on Adult Swim. In early January 2006 I filled out this online form to suggest The Boondocks to TeleToon. 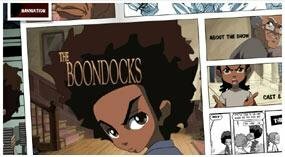 Next month TeleToon announces they will be airing The Boondocks starting February 17th, 2006, after repeats of Clone High wraps up. The Boondocks is based on Aaron McGruder's popular syndicated U.S. comic strip, the new animated series from filmmaker Reginald Hudlin (House Party) is filled with biting social-political humour and pure comedy fun. The Boondocks features socially conscious 10-year-old Huey and his aspiring rap-star brother, 8-year-old Riley, both voiced by Regina King. Gruff coach potato "Granddad" Robert Freeman, voiced by veteran comedian John Witherspoon, lays down the law with his constantly battling grandkids and tried to instill common-sense values in these wisecracking inner-city brothers suffering from culture shock in suburbia. Catch The Boondocks on Friday Nights at 10:30ET/PT on F-Night on TeleToon.